J.M.B. Inc. is the creator of the Ident-view Premium Glass Solar Filters. They have rigorous quality control standard to make sure their products are of the highest quality. Their solar filters have the reputation as being one of the best values on the market today. J.M.B. Inc offers three classes of visual and photographic solar filters. The Class A Visual & Photograpic Solar filters are made with superior polished glass and multi-alloy and steel alloy coating. These filters are extremely scratch and fade resistant. Can be used for visual and photographic use. Light transmission is 1/1000th of 1%. Neutral density - 5. 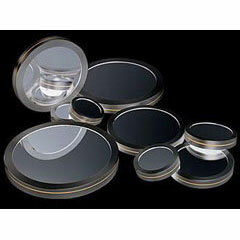 The Class B Visual & Photographic Solar Filters are made with polished glass and multi-alloy coating. These filters are extremely durable and will last for many years. Like The Class A they can be used visually and for photography and the light Transmission is 1/1000th of 1%. Neutral density - 5. J.M.B. 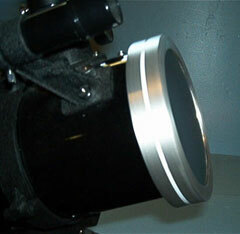 Class C Visual & Photographic Solar Filters are coated to a lighter density (ND-4). These filters are for photographic use only. Their light transmission is 1/100th of 1%. Binocular Solar Filters are another type of filter that J.M.B produces. These filter are fitted to binoculars from 40mm to 80mm. 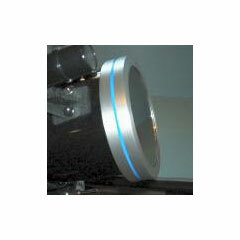 * These filters are custom made and are designed to fit over the objective end of your telescope tube assembly, or dew shield, as illustrated above. The various sizes listed refer to a "range" from which you'll select your filter. 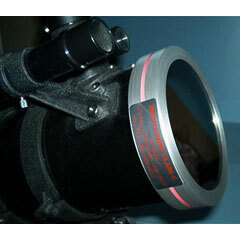 For example, an Astro-Physics Traveler 105mm refractor has a dew shield with an outside diameter measuring 4.94". You would purchase a 4.6"-5.5" Class A, B or C filter as as it falls within that "range". Thumbscrews on the new design allows a small adjustment for attachment to your tube assembly or dew shield. During checkout, in the NOTES SECTION please indicate your optical tube or dew shield (if applicable) OUTSIDE DIAMETER. JMB Class A Visual & Photographic Solar Filter 2" to 2.4"
JMB Class A Visual & Photographic Solar Filter 2.5" to 3.4"
JMB Class A Visual & Photographic Solar Filter 3.5" to 4.5"
JMB Class A Visual & Photographic Solar Filter 4.6" to 5.5"
JMB Class A Visual & Photographic Solar Filter 6.6" to 8.5"
JMB Class A Visual & Photographic Solar Filter 10.6" to 11.5"
JMB Class C Photographic Solar Filter 2" to 2.4"
JMB Class C Photographic Solar Filter 2.5" to 3.4"
JMB Class C Photographic Solar Filter 3.5" to 4.5"
JMB Class C Photographic Solar Filter 4.6" to 5.5"
JMB Class C Photographic Solar Filter 5.6" to 6.5"
JMB Class B Visual & Photographic Solar Filter 2" to 2.4"
JMB Class B Visual & Photographic Solar Filter 2.5" to 3.4"
JMB Class B Visual & Photographic Solar Filter 3.5" to 4.5"
JMB Class B Visual & Photographic Solar Filter 4.6" to 5.5"
JMB Class B Visual & Photographic Solar Filter 6.6" to 8.5"
JMB Class B Visual & Photographic Solar Filter 10.6" to 11.5"
JMB Class B Visual & Photographic Solar Filter 11.6" to 13.5"